We pull up to the entrance to National Trust, Petworth House and we’re given a shrug and an embarrassed smile by a man in a hi-vis vest. It’s Mother’s Day, the weather is glorious, and the car park is already full. Darren sees a potential spot on the other side of the green, so we park there. He does his bit to camera and I faff. We have to queue to enter, and I question the wisdom of having just one small hut for all incoming and outgoing traffic. Especially since half the people are also renewing their National Trust membership and receiving the same enthusiastic and unhurried welcome speech that I received when I signed up. It’s in the tens of minutes. 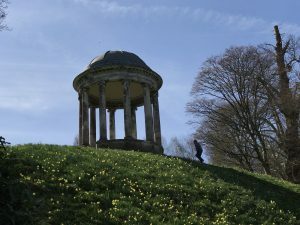 Once inside the National Trust grounds of Petworth House, we’re granted the immediate satisfaction of a lovely folly(?) on the top of a hill. Oh yes. This is going to be scenic. A short walk up a daffodil-lined pathway and we come to Petworth House itself. The building is grand an imposing, if a little featureless and grey. The rolling gardens are inviting, and the sun is shining off a lake. It has ‘picnic’ written all over it. But we’re on a schedule since we’re meeting my family for dinner, so we head into the house. (£15 per person for non-members, so make sure you bring your National Trust card!). I’m struck by how grand it all is. We wander through rooms filled from floor to ceiling with oil paintings. Darren has already had to take off his rucksack, and is told rather stiffly that he isn’t allowed to film in here either. Photos only. As we pass f rom room to room I notice the cool, grey décor. Laurence Llewellyn-Bowen is right, cool neutral colours do make spaces appear larger. We pass more paintings and statues and come to what can only be described as a feature staircase. The murals are breathtaking. We’re allowed up to the top of the stairs to take in the artwork, then back down and into the art collections proper. In keeping with the grandiosity of the place, the servants’ quarters are in a separate building across a courtyard. I’m excited to see them because I have a thing for historical kitchens. I explore the rows of preserves, a quiet still room and the ice house. Laying a hand on the shelves in the ice house I can feel how cold they are, and I imagine them lined with meat pies and freshly churned butter. 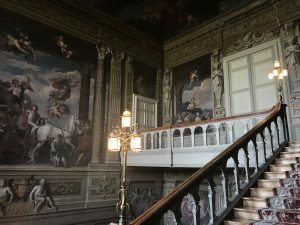 All in all we enjoyed our visit to Petworth House, and we plan to go back with a picnic one day to roam the 700-acre pleasure grounds. It taught me a valuable lesson too – not all stately homes feel the same. Each one has its own history, and its own surprises.